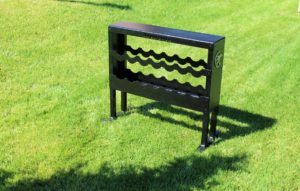 Here is a look at the RHI Teak Collection in computerized renderings. 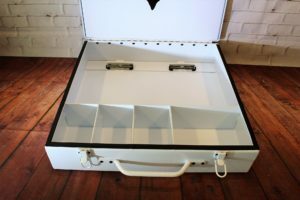 Above shows how beautiful and classic that the ‘teak’ looks like in real-life. 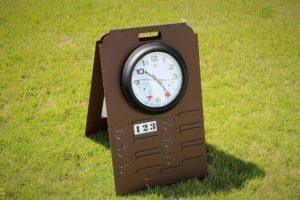 Today’s blog starts with the accessories that we built for the University of Arizona at their home course, Sewailo. 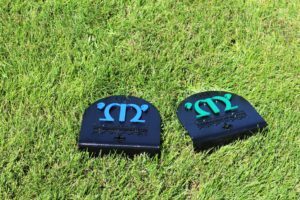 They chose from our new line of custom insulated coolers that was our best selling new product of 2016. 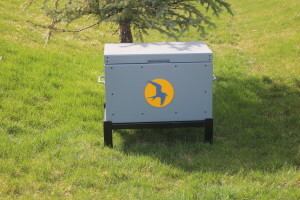 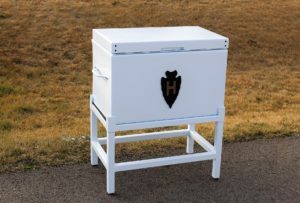 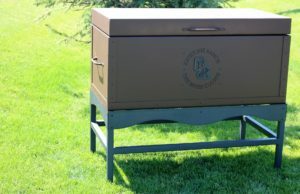 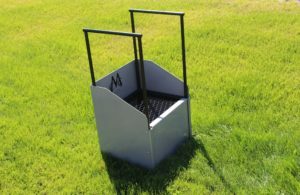 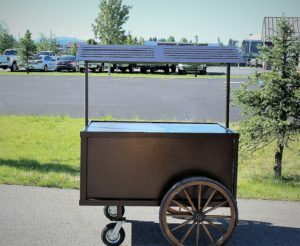 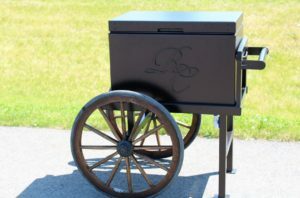 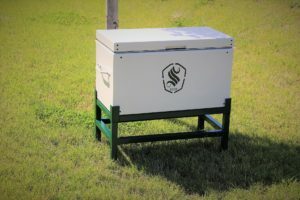 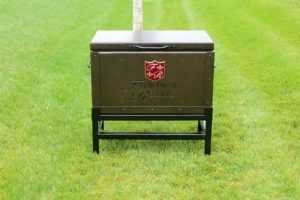 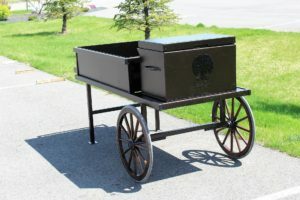 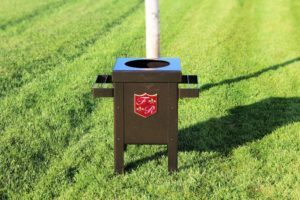 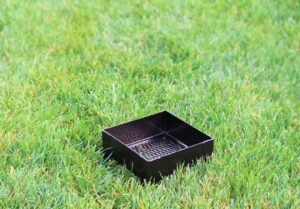 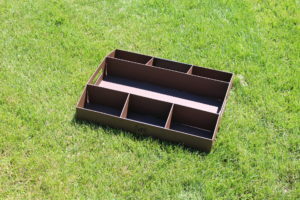 Next, is a club cleaning station and a divot mix box with a hinged lid. 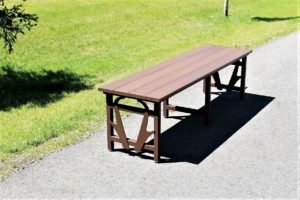 For the benches, we used a light colored trex, which is much more comfortable and durable than wood. 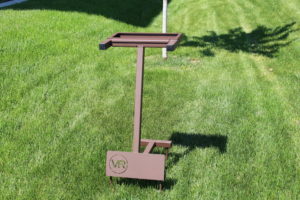 The logo looks really nice on the panels on this 6′ bench. 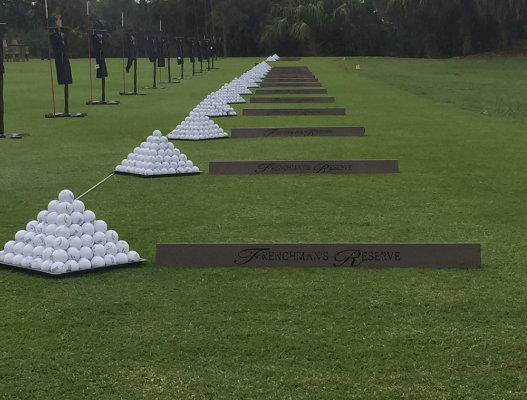 PGA West worked with us again for their legends event this month. 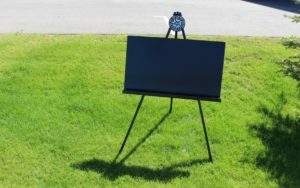 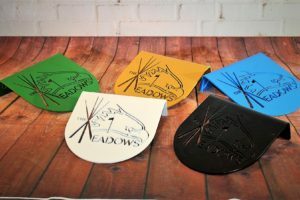 We made driving range targets and table center pieces drawn from the silhouettes of Arnold Palmer, Jack Nicklaus and Tom Weiskopf. 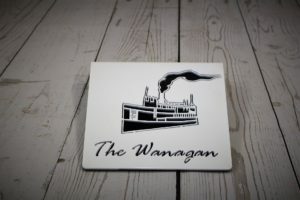 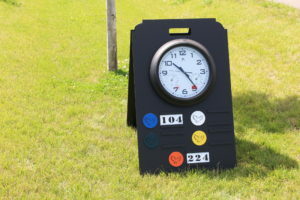 Last, on signage is the clock sign that we made for The Vintage Club. 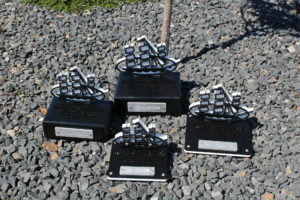 For perpetual awards built an oil rig trophy for ExonMobile. 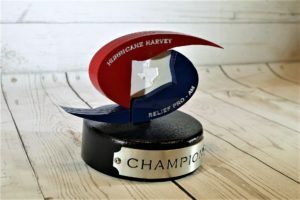 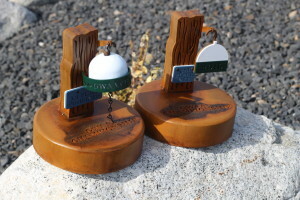 We also made a driftwood inspired perpetual trophy. 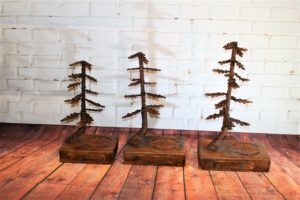 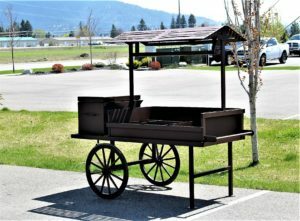 Real driftwood has durability issues through the years, so our client chose a metal ‘driftwood’ instead. 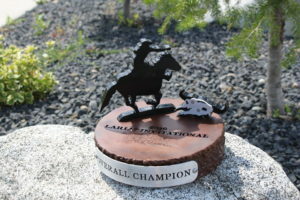 Lastly for awards, are the individual trophies that we made for Southern Dunes and for University of Oklahoma. 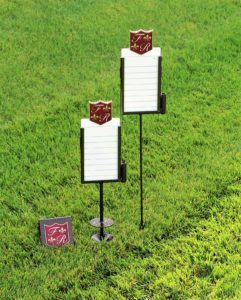 Besides awards, a must-have for tournament supplies is custom proximity markers with your logo and club colors. 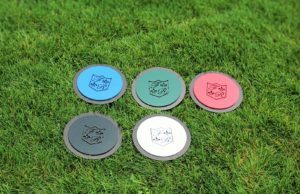 These greatly increase the speed of play and add another level of professionalism to your events. To end today’s blog, here’s a peak at a custom prototype that we’re working on. 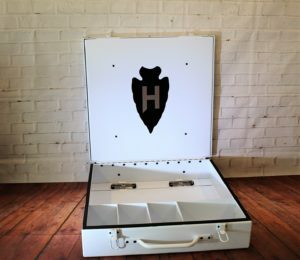 As everyone knows, there’s value in presentation. 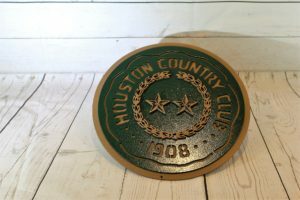 Today’s blog post is to show how to tie in colors and logo for a consistent look. 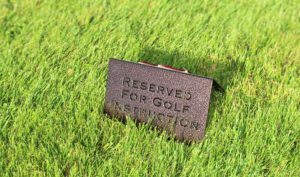 18-hole, 6,855-yard, par-72 Arnold Palmer Signature Golf Course in South Florida is complete with a driving range, 2 putting greens and a chipping area. 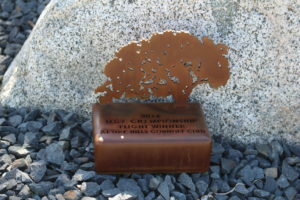 We kept the main color as copper vein, which is a 2 toned warm coppery brown speckled with black. 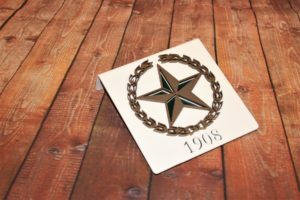 We stayed true to their burgundy/gold/white logo colors. 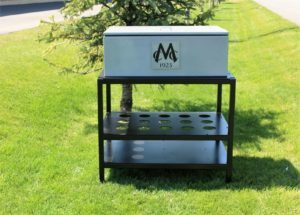 To begin, we built a slanted topped starter’s podium with top and back storage. 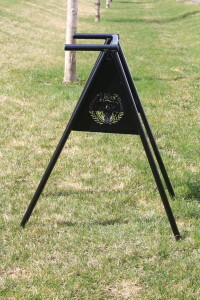 The upright twisted bag stands have holes drilled for alignment rods. 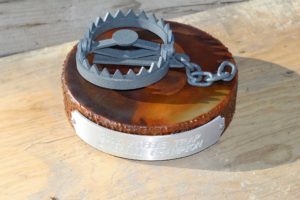 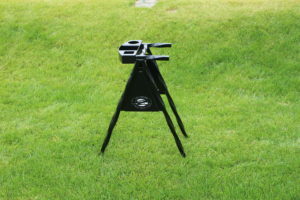 The base has prongs to insert in the ground for extra stability. 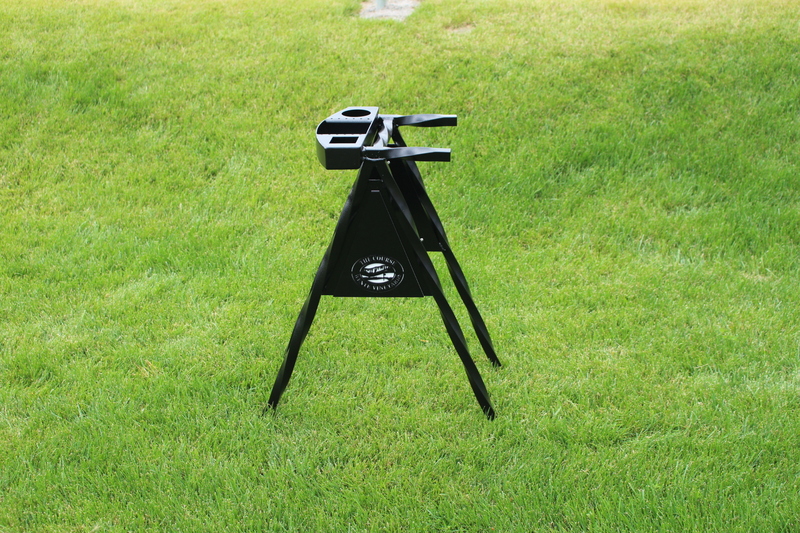 Next, are the range dividers and club washers that tie in nice with their bag stands. 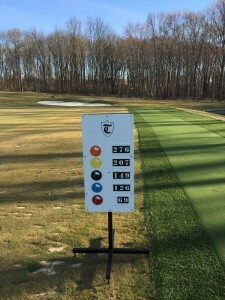 On their driving range sign, we did 2 columns of yardage for a wider/shorter look. 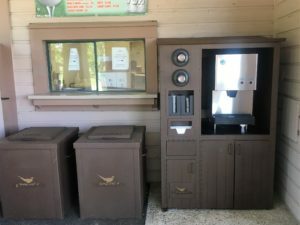 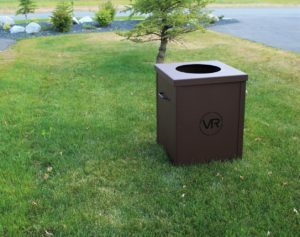 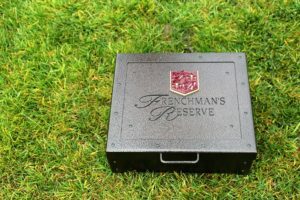 For the broken tee boxes & trash can enclosures, Frenchman’s Reserve chose to skip the logo, but keep the same color theme. 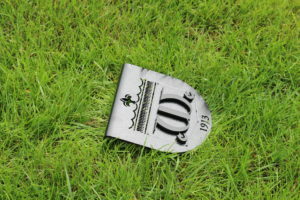 On the golf instruction signs we kept it subtle in size and then went crest only on the back. 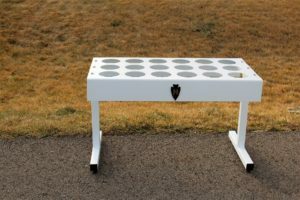 The RHI crew went simple/classy on the sand & seed racks. 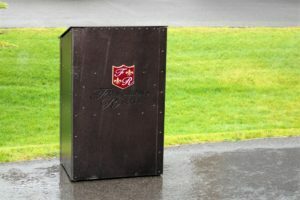 The crew made a sand box with full logo because we had the room on the unit, and it gave variety to logos among the other items. 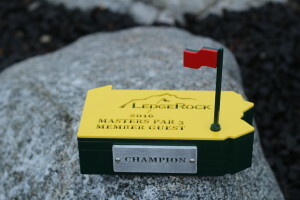 Next, is their scorecard box with post and attached pin location sign. 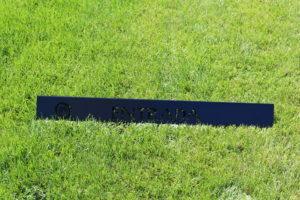 Here’s 2 photos of this piece. 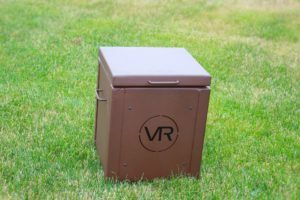 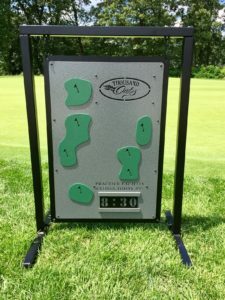 I took the box off of the post because I’m not tall enough to take a photo of the top of the box..
On their in-ground yardage markers, we skipped the yardage and went logo only. 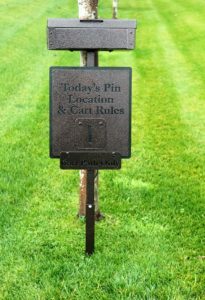 Last to share are their proximity markers and tee box announcements. 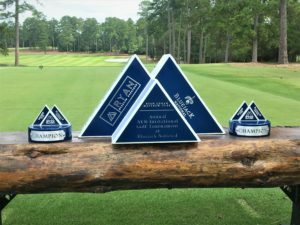 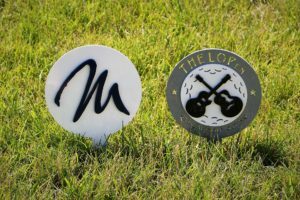 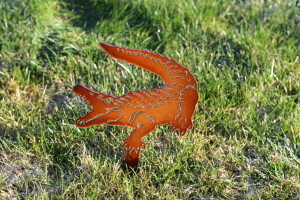 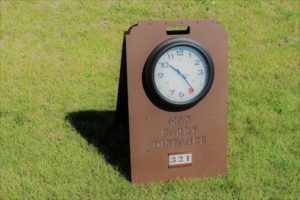 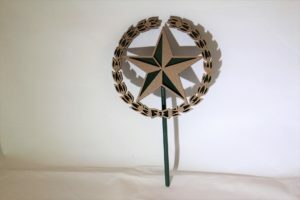 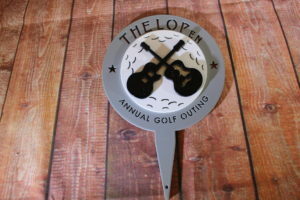 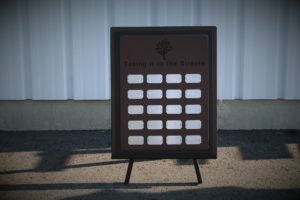 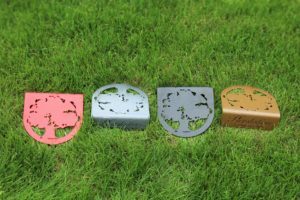 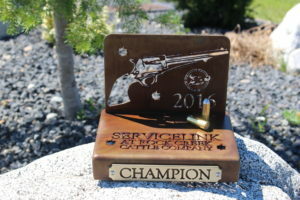 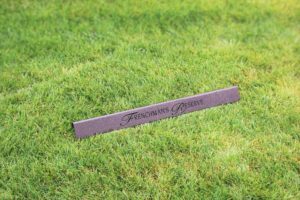 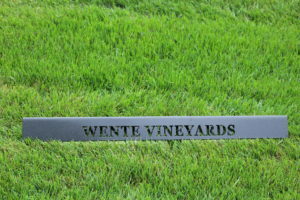 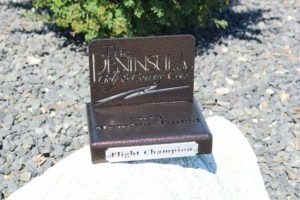 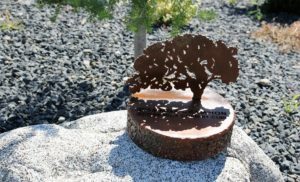 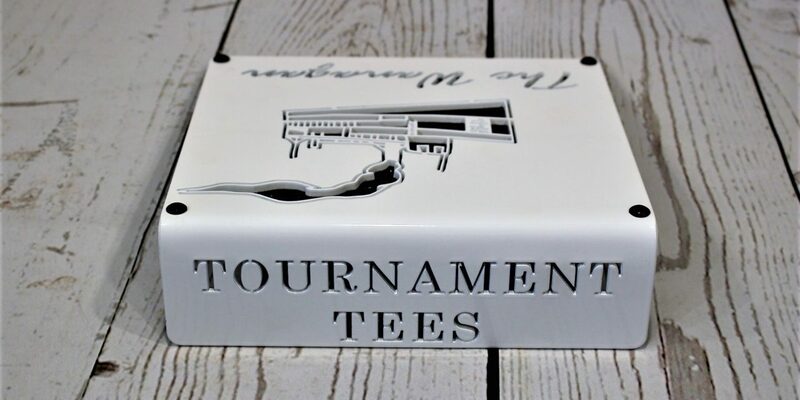 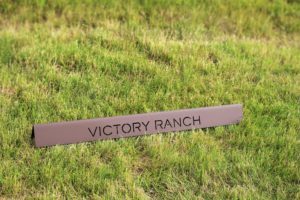 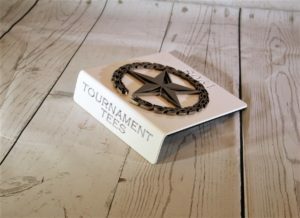 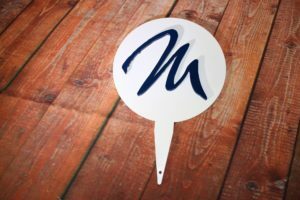 Tournament Tee Markers can get really creative and give your tournament a special look. 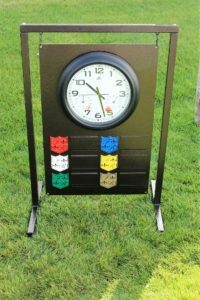 A great example of this is the tournament markers that will be at The Concession. 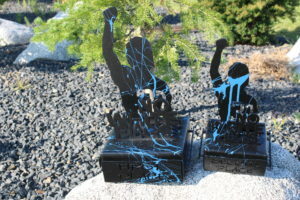 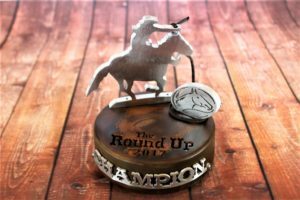 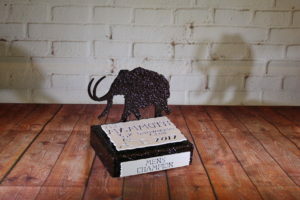 The RHI Crew has a few trophies that have gone out the door in the last day. 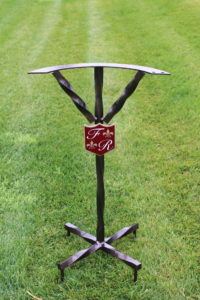 1) Golf Writer’s Association has new themed awards every year & we love to rise to the occasion to ‘wow’ the winners. 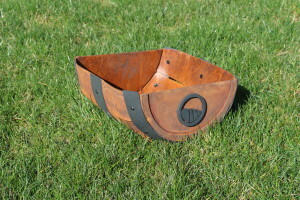 2) LedgeRock strayed away from the usually circle or rectangle base with this ‘stacked’ look. 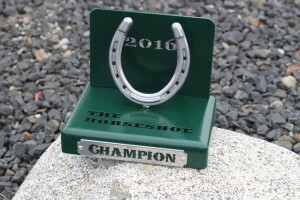 3) Horse Race Trophies for Whispering Pines. 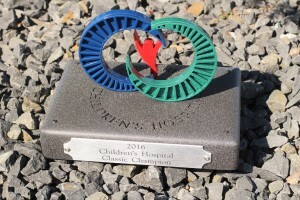 4) Children’s Hospital Awards. 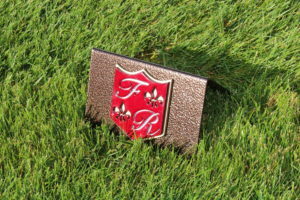 The Links at Summerly created a new multi-colored logo that was fun to work with. 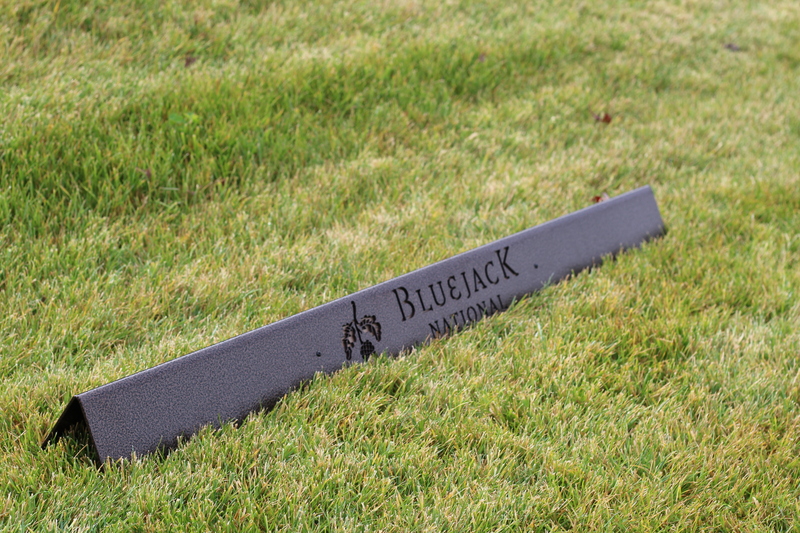 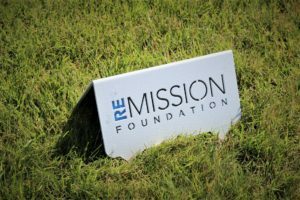 Each color of the logo is a separate piece of aluminum that we have pemmed together like a jigsaw puzzle. 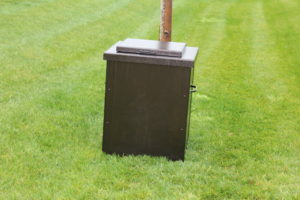 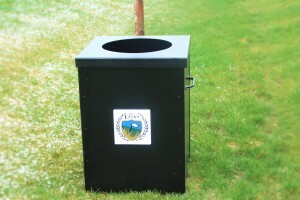 Below are their waste enclosures and club cleaning stations. 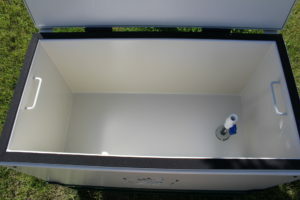 Next up is Galloway National’s insulated cooler on a stand. 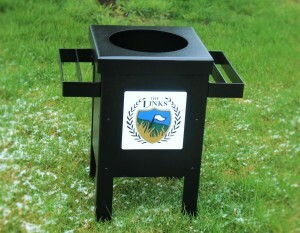 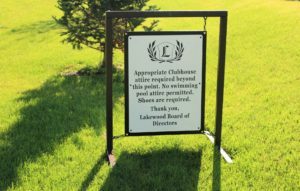 Below is The Links’ bag stand with the cutout logo and Union League’s driving range sign. 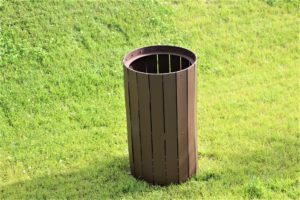 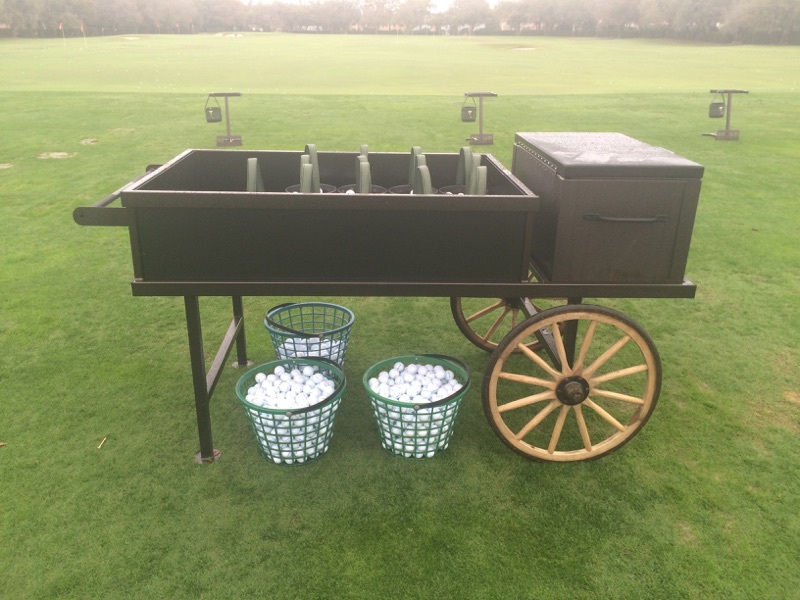 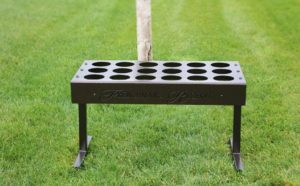 Lastly, is one of our best selling products, the 1/2 barrel driving range basket for The Cliffs.